We bought the house y'all! Whoa...what a ride!! I have a few more gray hairs on my head, but we have keys! I launched a new blog. We packed up our house to move. ...and it's Matt's birthday today! Oh my goodness! We are a bit tired, extremely grateful, and feeling a little crazy. So to celebrate, my eBook is available for whatever price you would like to pay. TODAY ONLY! Click on over to get your copy! And please be sure to spread the word! P.S. Texture Clothing winner will be announced later today! The Dreadlock Journey is READY! I am a little teary-eyed as I announce this...because I can hardly believe it's true. 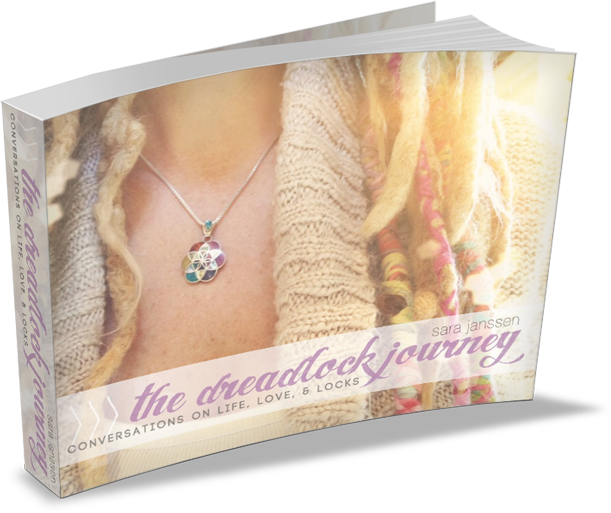 The Dreadlock Journey is OFFICIALLY ready for download! A big thank you to everyone who purchased it this past week. Your copy has been emailed to you and I can't wait to hear your thoughts! It's also time to announce the winner of the custom Secret Message original art created by Mandy Steward! I will email you Brittney! For those that didn't win...be sure to stop by Mandy's etsy shop so she can create a secret message just for YOU! I am going to REST up reallllllly good this weekend. After these past two weeks of launching this blog and book, I am in desperate need of sleep and nourishment! Our house closing got bumped by a few days due to some unforeseen things on the bank's side...so that will give me some much needed extra time. I am so looking forward to writing more consistently here...it's been delightful interacting with all of you again. Let's tell the stories! Let's share our journeys! Let's get inspired! You do NOT want to miss this...stories from Mandy Steward, Denise Andrade, Pixie Campbell, Emily Falconbridge, Hillary Rain, Tara Wagner, Catina Jane, and SO many more lovelies. 32 to be exact! And of course, my dread-cutting story is included as well, along with other bonus goodies! Does this sound like something you just might LOVE? Sign up below for my brand new (love)LETTER! I will be sending out sneak peaks into the eBook, as well as pre-sale discounts! The (love)LETTER will also be a way for me to send out other fun things I find along my way!